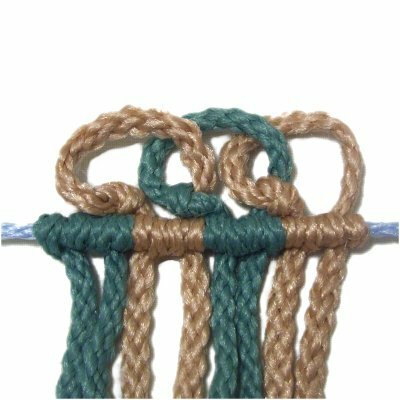 Description: The Linked Loop Mount is a combination of loops, Overhand knots, and Double Half Hitches. Each cord is linked to the one next to it. This mounting technique can be used when attaching cords to dowels and holding cords. 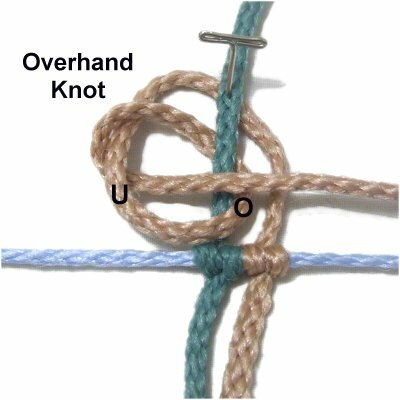 It's not as easy to do on a ring, since you need room to move the knots. Once the ring is almost covered, it's harder to make the loops. Make sure you know how to tie Double Half Hitches before you get started. 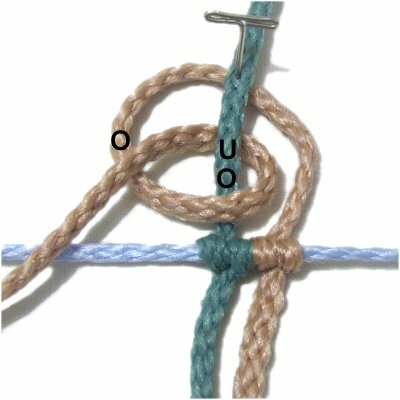 Preparation: You need 4 working cords to practice the Linked Loop Mount, as well as one holding cord. Secure the holding cord horizontally on your board. Stretch it so it has tension. Step 1: Place the first working cord under the holding cord vertically. 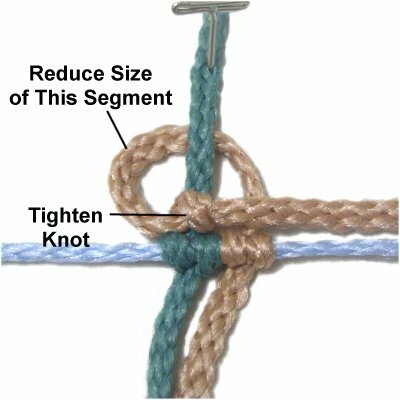 Match the ends so the center point is against the top edge of the holding cord. Secure it at the center. 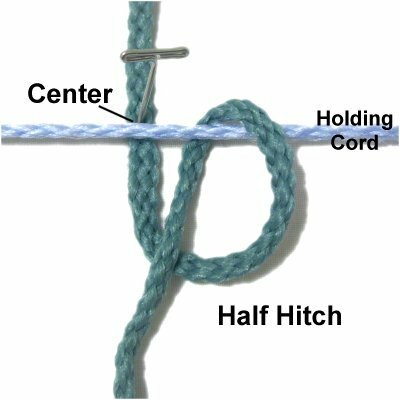 Attach the lower portion to the holding cord with a Double Half Hitch (DHH). 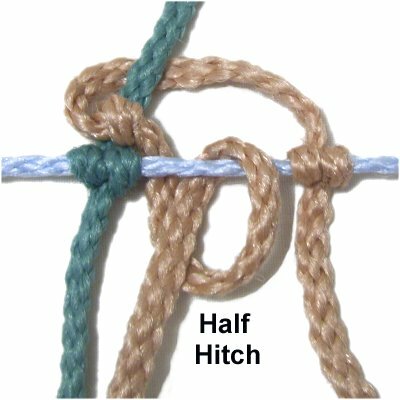 This image shows a single Half Hitch. Make sure you tie two. Repeat the same process with another cord, placing it to the right of the first one. Step 2: Mentally number the two cords as shown. Arrange cord 2 so it's vertical. Approximately 1.5 to 2 inches from the holding cord, pass the top portion of cord 1 under cord 2, heading left. Secure both cords together where they cross. 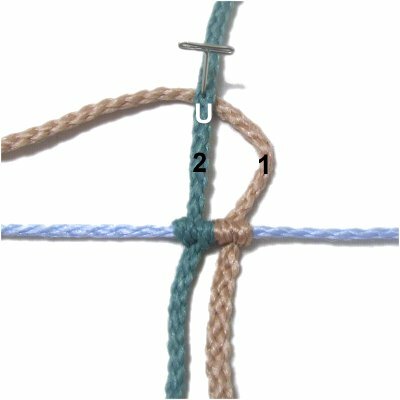 Step 3: Make a counter-clockwise loop with cord 1, passing over - under cord 2. As you pull it left, pass over cord 1 to complete the loop. It should be horizontal, heading left to right. Step 5: Reduce the size of cord 1 in the area where it crosses under cord 2. It should be no more than 1-inch above the holding cord. 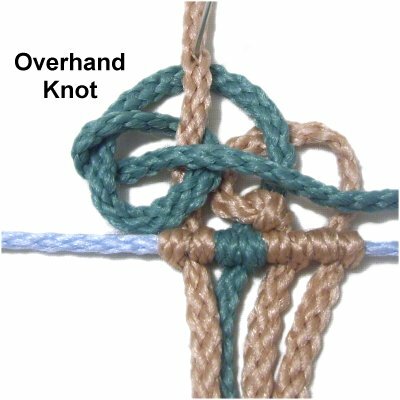 Tighten the Overhand knot by pulling on cord 1. It should rest against the DHH on the holding cord. 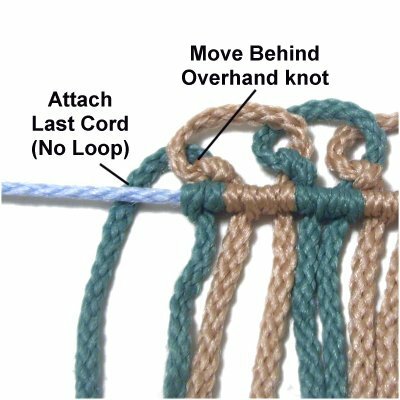 Designer's Tip: When using the Linked Loop Mount in a Macrame project, the loops need to be visible, but not excessively large. For 4mm to 6mm material, the loops should be no taller than 1-inch. For 2mm - 3mm material, reduce the size to 3/4-inch or less. Step 6: Move the DHH on the holding cord sideways to make some room. 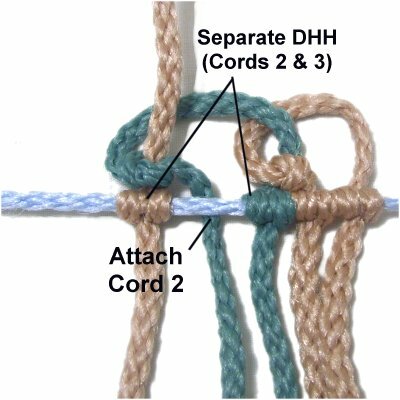 Pass the top half of cord 1 under the holding cord, in the area between the two DHH. Step 7: Attach the top half of cord 1 to the holding cord with a Double Half Hitch. It's less awkward to tie it left to right. Push all three DHH close together before attaching the next cord for the Linked Loop Mount. Step 8: Repeat step 1, attaching cord 3 to the holding cord vertically. It should rest to the left of cord 2. Repeat step 2 using cord 2 to start the next loop. Step 9: Repeat steps 3 - 5, to complete the loop with cord 2. Step 10: Separate the DHH made by cords 2 and 3 to make room. Repeat steps 6 - 7 to attach cord 2 to the holding cord (top portion). Step 11: Repeat step 1, attaching the lower portion of cord 4 to the holding cord with DHH. 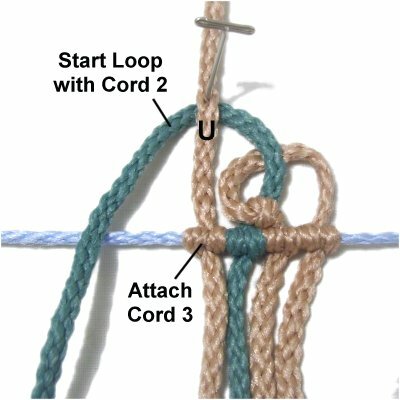 Repeat steps 2 - 7 to make the next loop with cord 3. You can continue on, adding more cords and repeating the same steps. Or you can stop here and finish the Linked Loop Mount by completing the next step. Step 12: You can't make a loop with the last cord, since there is nothing to attach it to. 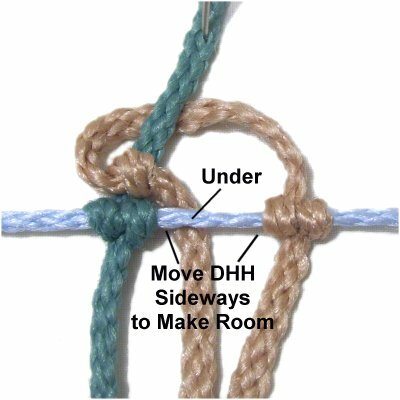 Pass it behind the Overhand knot made by the previous cord, then bring it under the holding cord and attach it with a DHH. Have any comments about the Linked Loop Mount? Contact Me.